That sums up the sentiments in an hourlong talk by Ricardo Salinas Pliego, Mexican businessmen and one of Forbes World’s Richest People who serves as president and CEO of Grupo Salinas. 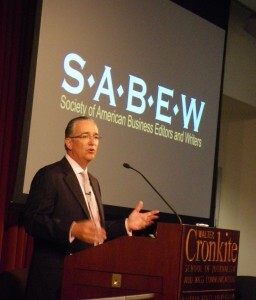 The Mexican retail magnate challenged business editors and reporters at his Friday afternoon talk at SABEW to help challenge the U.S. audience to rethink the relationship between the two countries. This entry was posted in BizJ and tagged clips, Robin J Phillips. Bookmark the permalink.